When buying a new product online; do you read the reviews before you buy? Well, you are not alone! 92% of consumers read online reviews. Just like when buying a product, customers will read reviews before choosing to do business with your company. In today’s digital world, the online presence of your business should be one of your highest priorities. Your online reputation isn’t just the result of what you generate on your website and your social media, but also the reviews from your customers which can be found on Google, Facebook, Trustpilot and many more trusted review sites. 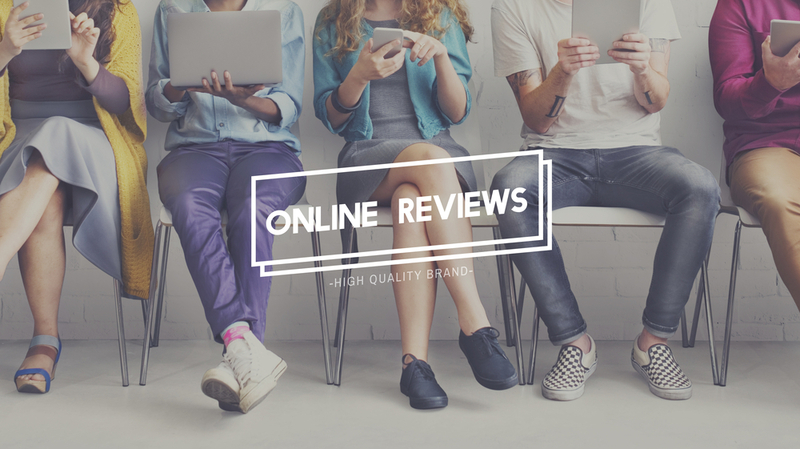 Reviews hold a huge amount of power for the success of your business, so it’s important to understand how to use reviews, good and bad, to build your online reputation. 40% of consumers form an opinion by reading just one to three reviews. 68% say positive reviews make them trust a local business more. Businesses spend a huge amount of time promoting themselves and the value of their services, but nothing is more valuable or credible to a customer than the approval of a real customer. Potential customers are much more likely to listen to other customers than the business themselves, saying how great they are! The positive reviews can be shared across your social media, website and other promotional materials thus becoming a valuable marketing resource for your company. Reviews tend to focus on the customer experience and the business as a whole, rather than a specific product. This means potential customers get a real insight into what it’s like to work with your business, as well as the services you offer. Online reviews help to convey your business’s personality and values to customers. How you respond to reviews, good and bad, will provide the customer with valuable information about what you are like to work with and what your priorities are; whether it’s customer satisfaction or just trying to make yourself look good. Good reviews can help with SEO. Google will pull data from review sites for its search results, so the more good reviews you have, the better your ranking will become. No one likes a bad review. It can be hard to hear, especially as a business owner. When you work so hard to maintain a positive online reputation, a negative review can seem crushing to your business. But, they may not be as bad as you first think. Negative reviews add a human element to your business. No one wants to work with a faceless company who has 100% positive feedback, as customers may suspect they are fake reviews and therefore will not trust the company. If you handle the negative review correctly and try to resolve the problem, it will show you care about your customers and your company, having a positive effect overall. Often, readers seek out negative reviews first. They grab readers’ attention and allow them to discover how you handled the problem. If they can see you actively worked to resolve the problem, and put the customer first then this will reassure the customer. They will then go on to read more positive and good things about your company. Negative reviews can alert you to problems that need to be fixed such as a poorly trained employee, if all staff needs more training, or if a product or service is not working for customers in the manner you intended. They can show you weakness in your company which you never knew existed, so can help you to improve your business. Don’t respond hastily! Gather as much information and data about what happened with that customer from staff members and your records. Plan your response carefully, ensuring it is polite and understanding of their frustration. Don’t fully resolve the issue publicly: although you should respond publicly, try to move the conversation to direct messaging or another form of one-to-one contact. This is a more professional way of dealing with the customer than resolving it publicly for all to see. The most important thing is for potential customers to see you responded, offered a contact and therefore attempted to resolve the problem. Do accept the feedback: listen and learn from the feedback, it may be valuable to helping your company improve. Make it as easy as possible! Set up profiles for your business on different websites, like Google, Facebook, TripAdvisor, or Trustpilot, so whichever website they prefer to use or trust, they can use. The chances are your customers understand the importance of reviews and why you need them, so they will be more than willing to write one; especially if they have had a positive experience! Post positive reviews on social media. If you share your reviews, not only will it positively promote your company but it will encourage others to leave reviews as they will see that you value them. Include links to where customers can leave their own review when you create the posts. This will encourage others to leave reviews, and it shows how much you value their opinions and their time for writing a review. You could offer a 10% discount or similar offer for any customer who writes a review, on their next purchase. Everyone loves a discount! Reviews are important for every business, including ours! We would love our customers to write us a review about their experience with Brace on our Facebook page or on Google. Simply visit the ‘review’ tab on our Facebook page, or search for ‘Brace Creative Agency’ on Google and click ‘write a review‘ on the right-hand side of the results page. Thank you! For more information about online reviews, handling a negative review, or improving your online presence; contact the Brace team today.